Check out part 1 one of our Google Glass series by clicking here. Part 3 will continue to further discuss the Age of Context and how this is critical in how and why we engage our candidates, alumni networks and employees. When we stop to see how technology has impacted the world wide web of recruiting in the past decade, we realize how much has changed. Google Glass is an example of how advanced technology is shaping recruiting and how it is changing the candidate experience. The new sense of urgency and communication styles that lead to engaging relationships are just the beginning of the tipping point that will impact how companies need to hire and manage talent. 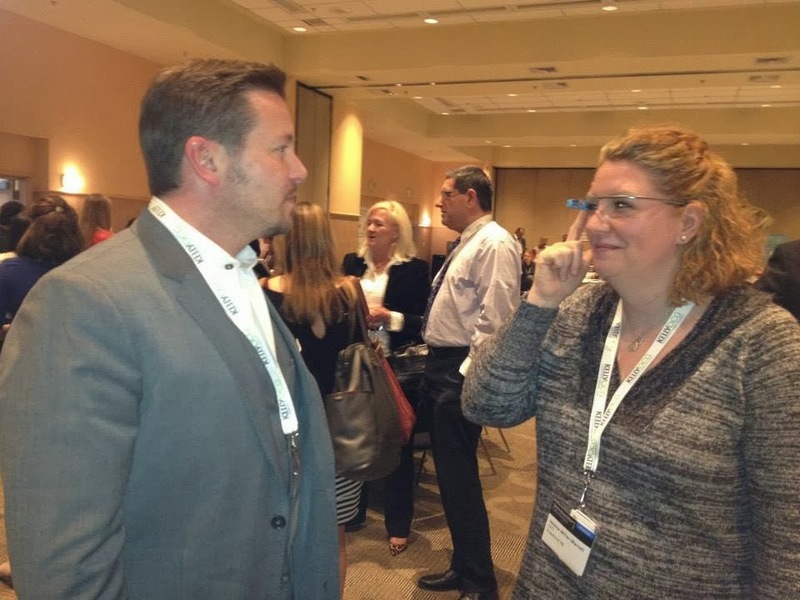 When I wear my Google Glasses (photo of me at the HR.com conference above), the world is at my fingertips. I have customized information, resources and experiences only for me. This is true with most wearable technology at current including fitness technology like Jawbones or Fitbits. The experience, engagement and involvement is unique to us just as is our work experience, resume and special skills that make a job seeker a valuable asset for an employer. The age of context will require us to have a deep understanding of innovative systems, like Google Glass, that go beyond social media, wearable technology and mobility. Emerging technologies are clearly impacting the workplace and causing big shifts in today’s digital world and talent management. To stay ahead of the curve, let’s take a peek into the up and coming trends and why it is important to the future success of how organizations are successful in hiring. What does the future of recruitment look like? 2020 once seemed so far away, however, the most successful strategies will require industry professionals and who understand how the future of recruitment will be shifting and be prepared to adapt. No other era has experienced the high rates of global connectivity like the years between now and 2020. Are you curious in how mobility will make its mark in the talent marketplace? You need to be because it will be a major shift, demanding new ways in how the global workforce will be sourced, organized and managed. 10 future trends you need to know about mobility talent. 1. Mobility will double from the current rate of 25% to 50% growth of mobile workforce. 2. Global career destinations will be part of the hiring discussion. 3. Across border regulations will require businesses and governments to collaborate in the name of economic development. 4. Population in urban areas will continue to rise throughout the globe. 5. A spike in highly diverse talent will come from a combination of the emerging countries with the three groups of generations, causing an ever-shifting demographic challenge. 6. HR professionals will be required to have necessary technology that shows data and analytics to support mobility decisions. 7. Western nations will struggle to compete with the new centers for talent emerging from economies leapfrogging out of Africa and Latin America. 8. According to 30% of the CEOs surveyed, there is a concern that they will not have the necessary talent to fulfill their future growth ambitions. 9. The millennial generation will dominate the workforce. They are expected to be job hoppers valuing quality of life and opportunity of growth over monetary awards. 10. Businesses will require innovative skills that include high tech positions like data scientists, engineers and developers. Many of the jobs are unknown and not defined as of today. Mobility talent in the next six years will require globalization strategies that tap into emerging markets leading to expanded new office locations, relocation programs and new techniques to source talent from around the world. When considering your mobile strategy as you prepare for an international, borderless workforce, success will rely on ability to manage compliance issues while implementing these trends. Knowing these trends that will impact the global workforce tells us that being nimble and mobile with the talent pool is the key to a healthy and happy workplace filled with engaged and empowered employees. Jessica Miller-Merrell, SPHR is a workplace and technology strategist specializing in HR and recruiting. She’s the founder of the HR blog, Blogging4Jobs. You can follow her on Twitter @jmillermerrell. Nerd a pair of smart glasses are all over the place right now. It is of course, somewhat associated with an paradox, due to the fact nerd eyeglasses, in addition to nerd trendy particularly, can be a paean to style also to any tenacious refusal to blend in using the herd. Apart from the rolex replica uk it's mostly aware of start a noise exploration as regards the right sewing, model in addition to stuff to help check, When i realize its likewise the better plan to help get accustomed to this measurement referrals prior to be satisfied from any of the sports baseball sizing's. From the start, well then, i'll pressure omega replica sale in this article that you should talk to ones league if you experience almost any particular measurement you will need to work with on your process. My business is indicating that regardless of the fact that, there are various measurement together with era cheap rolex replica mainly because almost all competitors complete include fixed tips many people remain faithful to. When you're wanting to pick the baseball, then you can try out a sports retail store or maybe sports area of expertise retail store. You possibly can decide on a range of sizing's, hublot replica in addition to charges. You can obtain ones issues all over a great encountered workers to get people as a result of. The sole thing that any of us is able to do is usually aim to get a corporation that's model wristwatches including tag heuer replica available for purchase on the net.